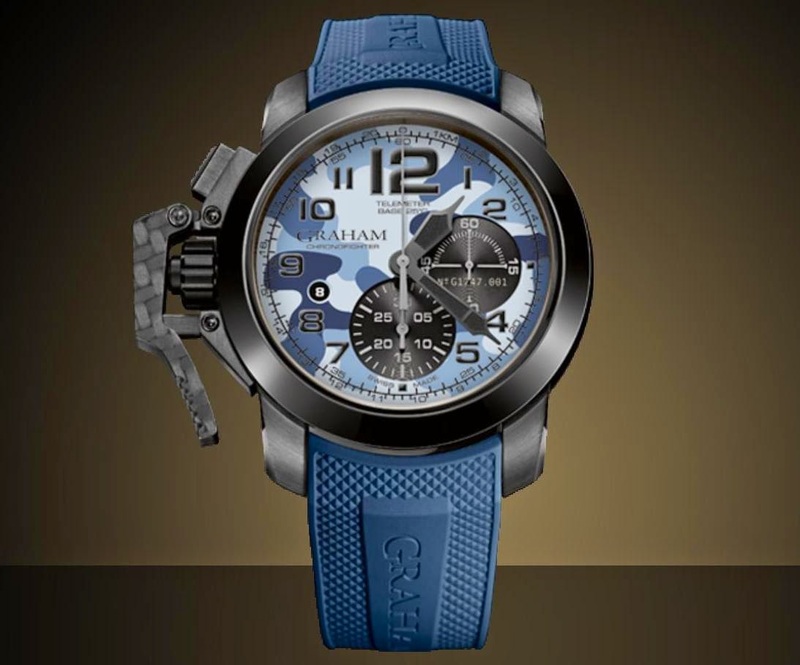 Sophistically dressed with a tasteful blend of military camouflage, the trendy Chronofighter Oversize Black Arrow black PVD chronograph series features a plain carbon trigger and a telemeter function to remain in the vanguard in the fight for innovation. Dedicated to action and courage, the Chronofighter Oversize Black Arrow watches, present distinctive military style fatigues on a silkscreen printed dial. Each dial is engraved with a unique identification number on the seconds counter, based on regimental numbers. 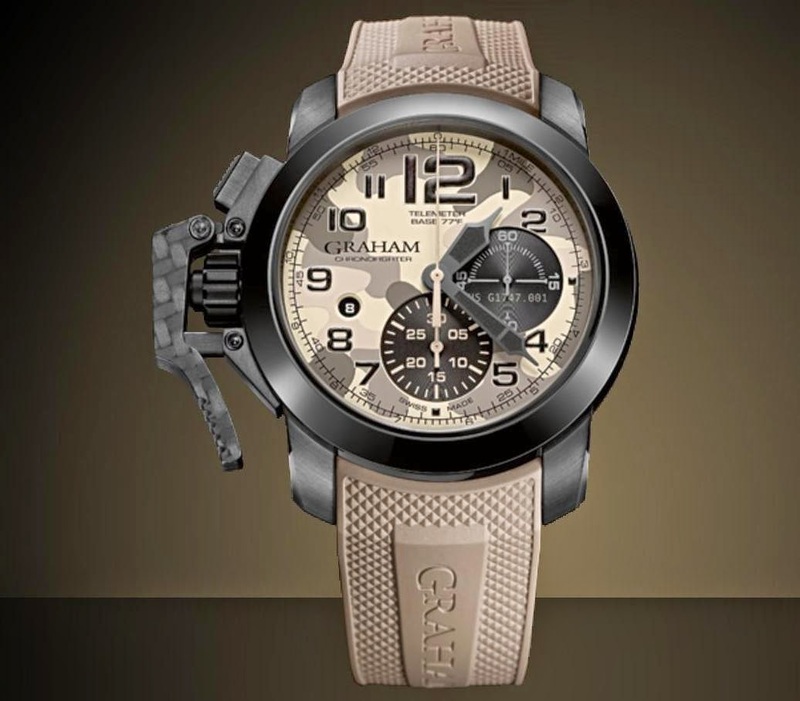 The start and stop lever on the left of the case, the renowned GRAHAM signature, is made of plain carbon material and results from a very specific machining process. This means that the lever is a unique piece of carbon which provides the watch with more stiffness and enhanced usability. To brave the elements, each watch is endowed with a calculated telemeter scale. It enables to measure distances thanks to the speed of sound by starting the chronograph when a visible event occurs (e.g. lightning, explosion) and stop it when the sound reaches the observer (e.g. thunder, deflagration). As the temperature influences the speed of sound, our engineers have based their calculations on 25°C, the average temperature on Earth. The distance in kilometres can be measured on the dial thanks to the scale rim (346 m/s). Toughness and dexterity are the master words of the Chronofighter Oversize Black Arrow. Enhanced with a black ceramic bezel, it ensures an undeniable shimmer and self-assurance to this trendy series. Trilogy set limited to 100 pieces. Main features also include: 47 mm steel with black PVD case, calibre G1747 automatic chronograph, telemeter (Celsius /km) (available with Fahrenheit/miles), date at 8 o’clock, 25 jewels, 28’800 A/h (4Hz), Incabloc shock absorber, 48 hours power reserve, camouflage painted dial (silkscreen printing) with identification number, black carbon fast action start/stop trigger, sapphire crystal with antireflective coating on both faces, black PVD crystal case back, coloured rubber strap with “Clous de Paris”.